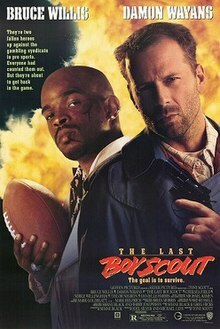 The Last Boy Scout is a 1991 American action comedy film directed by Tony Scott, starring Bruce Willis, Damon Wayans, Chelsea Field, Noble Willingham, Taylor Negron and Danielle Harris. The film was released in the United States on December 13, 1991. During halftime at a televised football game, L.A. Stallions running back Billy Cole (Billy Blanks) receives a phone call from a mysterious man named Milo (Taylor Negron), who warns him to win the game or he will be assassinated. Cole ingests PCP and, in a drug-induced rage, brings a gun onto the field, shooting three opposing players to reach the end zone. Cole then shoots himself in the head. Meanwhile, private investigator Joe Hallenbeck (Bruce Willis), a disgraced former Secret Service agent, who at one time was a national hero for saving the president from an assassination attempt, discovers that his wife Sarah (Chelsea Field) is having an affair with his best friend and business partner, Mike Matthews (Bruce McGill). Mike gives Joe an assignment to act as bodyguard for a stripper named Cory (Halle Berry). Mike is then killed by a car bomb outside Joe's house. Joe is approached by Cory's boyfriend, former Stallions quarterback Jimmy Dix (Damon Wayans), who was banned from the league on gambling charges and alleged drug abuse. After an argument between Joe and Jimmy, an annoyed Jimmy takes Cory from the stage while she is performing. Joe plans to wait outside, where he is knocked out by a team of hitmen. Jimmy and Cory leave the bar in separate cars while Joe is left to dispatch one of the hitmen. When Cory is struck from behind and stops to confront the other driver, she is killed by the hitmen. Jimmy is fired upon and pinned down, but is saved by Joe. At Cory's house, Jimmy and Joe find a taped phone conversation between Senator Calvin Baynard (Chelcie Ross), who is leading a congressional investigation into gambling in sports, and Stallions owner Sheldon Marcone (Noble Willingham). When the tape is ruined in Joe's faulty car stereo, Jimmy realizes that Cory tried using the tape against Marcone to put Jimmy back on the team, prompting Marcone to send the hitmen. Joe saves Jimmy from a second car bomb, and manages to trick two hitmen into blowing themselves up. Unfortunately, the explosion destroys the remaining evidence. Joe reveals to Jimmy that when he was in the Secret Service, he witnessed Baynard torturing a woman in a hotel room and assaulted the senator to thwart the attack. Baynard retaliated by having Joe fired from the Secret Service for refusing to cover up the incident. At Joe's house, Jimmy meets Joe's abrasive daughter Darian (Danielle Harris). When Joe catches Jimmy attempting to use illegal painkillers in the bathroom, Joe kicks him out. As Jimmy leaves, he is asked by Darian to sign a football trading card, stating that Joe was a fan of Jimmy's and never watched another game after he was banned from the league. He leaves her with the signed card, "To the daughter of the last Boy Scout." Learning of Mike's affair with Sarah, detectives Bessalo (Joe Santos) and McCaskey (Clarence Felder) assume that he was killed by Joe and move to make an arrest. But Milo, Marcone's top henchman, captures Joe first and shoots McCaskey using Joe's gun. Marcone explains to Joe that he has been buying Senate votes to legalize sports gambling, but that Baynard tried to blackmail Marcone for $6 million. Being aware of Joe's history with Baynard, Marcone says that it would be cheaper to kill the senator and frame Joe for the murder. Joe is forced to hand a briefcase filled with money to Baynard's bodyguards, who switched it with a wired briefcase. Joe is rescued by Jimmy and Darian, and acquires both briefcases after running the bodyguards and Milo off the road. However, Milo survives and while Darian is left to wait for the police, he abducts her. Heading to the stadium to rescue Darian, Joe and Jimmy are captured and escorted to Marcone's office. Jimmy creates a diversion, allowing them to fight their way free. Realizing Milo will attempt to shoot Baynard, Joe goes after him while sending Jimmy to warn the senator. Grabbing the game ball, Jimmy throws it at Baynard, knocking him down just as Milo starts shooting. Joe knocks Milo to the edge of the stadium light platform, where SWAT officers shoot him several times. Milo then falls into the moving rotor blades of a police helicopter. The briefcase of money is recovered and Marcone, having escaped with the rigged briefcase, is killed when he opens it at his estate. The next day, Joe and Sarah reconcile, and Joe and Jimmy decide to become partners. I was busy mourning my life and, in many ways, the loss of my first real love. I didn’t feel much like doing anything except smoking cigarettes and reading paperbacks. All things come around. Time passed and eventually I sat down and transformed some of that bitterness into a character, the central focus of a private eye story which became The Last Boy Scout. Writing that script was a very cathartic experience, one of the best experiences I’ve ever had. I spent so much time alone working on that. Days which I wouldn’t speak. Three, four days where I maybe said a couple words. It was a wonderfully intense time where my focus was better than it’s ever been. And I was rewarded so handsomely ($1.75 million) for that script, if felt like a vindication and like I was back on track. Roger Ebert, commenting on the script, said "The original screenplay for The Last Boy Scout set a record for its purchase price; that was probably because of the humor of the locker-room dialogue, since the plot itself could have been rewritten out of the Lethal Weapon movies by any film school grad." The Last Boy Scout was filmed in 90 days between March 11 and June 9, 1991. The movie had a very troubled production. Conflict and arguments flared between Joel Silver, Bruce Willis and Tony Scott. Although they play buddies in the film, Willis and Damon Wayans hated working with each other. Silver was described as "insane, with long, horrible fits of sanity,” and was compared to a fighter pilot riding as a passenger. “As soon as you hit a little bit of turbulence, he’s right away going to throw the guy out of the window and take over the steering.” Taylor Negron, who played Milo, described Silver as extremely hands-on in every aspect of the production. More problems emerged during post-production, when the original cut of the film turned out be a "borderline unwatchable workprint." Different editors were hired in an attempt to address Scott's tendency for filming excessive coverage with multiple cameras. Editor Mark Helfrich described sorting through "mountains of raw material" to edit the first cut: “There was more footage shot for The Last Boy Scout than on any film I had ever worked on.” He recalled with incredulity that the work of previous editors appeared to have been rejected, taken apart and put back into the daily reels: “There were still splices all over the place.” Expert action movie editor Mark Goldblatt, who also worked on the film, recalls it as one the most painful and frustrating experiences of his entire career, and refuses to discuss it in interviews, although he did mention in a podcast interview that several other editors were hired and then fired before him, and that Warner Bros. began testing the movie before it was completely finished. Studio executives fretted about the expanding budget, while less-than-enthusiastic reactions from a test screening audience, as well as the unlikeable character played by Willis, did little to allay these concerns. When editor Stuart Baird was hired, the film finally took a positive turn. Baird had been brought in to help re-edit other troubled productions, including Tango & Cash (1989) and Demolition Man (1993). Some later cuts were done with the film's graphic scenes after it was originally rated NC-17, which explains quick-cut edits in some of the death scenes in the film. Joel Silver said in a Q&A for The Nice Guys (2016) that Shane Black's original title was Die Hard. Silver asked if he could take the title for a project he was working on at the time called Nothing Lasts Forever, which eventually became Die Hard (1988). Shane Black and Tony Scott both said in later years how the original script was far better than the final film. The film was nominated for two MTV Movie Awards. The film under-performed expectations given the star power and hype surrounding the then record price paid for the screenplay by Shane Black ($1.75 million). Roger Ebert gave the film three stars, saying it was "a superb example of what it is: a glossy, skillful, cynical, smart, utterly corrupt and vilely misogynistic action thriller". It has a 46% approval rating on Rotten Tomatoes based on 35 reviews. Reviews were mixed, and some critics cited the Christmas time release for such a violent film as a reason for its somewhat underwhelming box office. It grossed $7,923,669 in its opening weekend, and the total gross was $59,509,925. Although the film was not a blockbuster, it helped Bruce Willis recover his star status after the disastrous Hudson Hawk and became hugely popular in the video rental market. The film's score was composed and conducted by Michael Kamen (who also scored Hudson Hawk that year), his only work for Tony Scott. Bill Medley performed the song "Friday Night's A Great Night For Football," written by Steve Dorff and John Bettis, on screen during the opening credits (the song is also reprised over the end titles); the song was released as a CD single by Curb Records. On August 25, 2015, La-La Land Records released a limited edition soundtrack album featuring most of Kamen's score, plus Medley's song. ^ "The Last Boy Scout – PowerGrind". The Wrap. Archived from the original on 2017-07-09. Retrieved August 9, 2017. ^ "The Last Boy Scout". Box Office Mojo. Retrieved 2016-01-18. ^ Bauer, Erik (1 December 2014). ""I Like Violence" – Shane Black". Creative Screenwriting. ^ Ebertdate=13 December 1991, Roger. "The Last Boy Scout Movie Review". Roger Ebert Reviews. ^ "Last Boy Scout, The (1991)". Turner Classic Movies. Retrieved 2016-01-18. ^ Taylor, Larry (17 May 2016). "'The Last Boy Scout', Shane Black and Tony Scott's LA Miracle". Retrieved 4 April 2017. ^ "A Talk With Taylor Negron - Retro Junk Article". Retrieved 4 April 2017. ^ "Who killed The Last Boy Scout? Bruce Willis, Shane Black and the making of an action masterpiece". Retrieved 4 April 2017. ^ Knight, Jacob (15 April 2015). "Acid In The Coliseum: The Films Of Tony Scott (Part Two)". Retrieved 4 April 2017. ^ Mengarelli, Frank (2 September 2016). "PTS Presents EDITOR'S SUITE with MARK GOLDBLATT Vol. 2". Retrieved 4 April 2017. ^ "Shane Black Reveals The Hero Of 'Predator' & It's Not Arnold Schwarzenegger, Talks Time Travel Horror Script And More". 9 June 2016. Retrieved 4 April 2017. ^ "The films of Tony Scott: The Last Boy Scout". CBS News. Retrieved 2016-01-18. ^ Adler, Leslie (1991-12-17). "Movie Studios Urgently Need Christmas Hits". The Los Angeles Times. Retrieved 2010-12-12. ^ "The Last Boy Scout". Chicago Sun Times. Retrieved 2010-12-12. ^ "The Last Boy Scout". Entertainment Weekly. 1992-01-10. Retrieved 2010-12-12. ^ "The Last Boy Scout". Washington Post. 1991-12-13. Retrieved 2010-12-12. ^ "The Last Boy Scout". The Los Angeles Times. Retrieved 2010-12-12. ^ "The Last Boy Scout". Variety. 1990-12-31. Retrieved 2010-12-12. ^ Fox, David J. (1991-12-23). "JFK, `Hook' Bring Out the Crowds `Hook' Stays Atop Weekend Box Office". The Los Angeles Times. Retrieved 2010-12-12. ^ Fox, David J. (1991-12-17). "Weekend Box Office Holiday Sweepstakes Starts This Week". The Los Angeles Times. Retrieved 2010-12-12. ^ Hunt, Dennis (1992-04-30). "Video Rental Chart : 'Last Boy Scout' Eyes First Place". The Los Angeles Times. Retrieved 2012-02-03. ^ Hochman, Steve (1992-05-14). "Video Rental Chart : A 'Boy Scout' Unseats a 'King'". The Los Angeles Times. Retrieved 2012-02-03. ^ ""Friday Night's A Great Night For Football"". ^ "The Last Boy Scout album page on La-La Land".